25 Responses to Orly Taitz: Quarantined! I was one of the first on PJ to warn people about the second infection trying to load itself unto my computer and since my computer was also hacked into a few weeks before – probably as a result of the first infection, I got interested into the provenance of this script (at this moment, Orly’s website already has the third version of it). I found out that the owner of these .cn “websites” is Alexei Nevedomskiy, an ethnic Russian probably “operating” from Central Asia (on some IPlocators, his IPs are shown as from Tashkent, Uzbekistan, but the guy’s favourite e-mail address is from Kazakhstan). One of Mr Nevedomskiy’s recent “exploits” was “collecting” logins and passwords from the Russian site “odnoklassniki” (classmates)very popular in the ex-Soviet diaspora. Nevedomskiy’s network looks like an heir to the notorious Russian Business Network and seems to share its former “business plan”, secure webhosting for pedophiles, criminal hackers and maffiosi who resell webhosting service to shady businessmen who they first blackmailed with threats of DDOSing their sites if they did not host with them. It would be rather funny if Orly Taitz were found to be in cahoots with Nevedomskiy – though of course many in what would become the RBN in 1989 were fiercely anti-communist (before they became Russian nationalists). Nevedomskiy may also be using dated technology (the old USSR servers in Central Asia) to avoid detection, which would explain why the scripts and rootkits that the phishers on the Nevedomskiy network use seem to be a bit dated as well. But it will still create havoc on new, but not very well protected systems. Thanks for the warning, and technical explanation. I went to her site a few times out of curiosity, but I’m just going to skip it. She’s in with right wingers, ignoring the anti-Semitism under the surface, because of her pathological hatred of Obama. Strange bedfellows. I am hoping the judge unloads at least $10K on her. She’ll either shut up, or flee to Israel. Well, if it’s a thing that sends you to Vistaprint card printing, ohforgoodnesssake accidently downloaded it too when he/she posted the latest Orly site infection, cuz when I got to ofgs, I get re-directed to vistaprint card-printing. Ithink I better go scrub-up. More and more I am beginning to agree with you Misha that she might flee. I think when she gets sanctioned by Land, dismissed by Carter, and goes back to the well to try and cover the sanctions, her followers will turn on her and start demanding refunds. Somebody is going to show up at her dental practice demanding a refund, that’s when she’ll skedaddle. It looks like either Orly is knowledgable or she is ignorant of what is going on. Since we call all attest to from her writings that she is not the sharpest knife in the drawer, then she is just ignorant of what is going on with her site. But what is the difference. With her paypal donation button she is getting something from her followers one way or another. So now if you refuse to answer obvious questions designed to get information that is not permissible, you are in cahoots with Obama to hide information? Can the brithers get any more ridiculous? I’m afraid you are probably right. McAffee blocked my access to the site. I could look at a google cache version and see it was indeed about the Orly Taitz (or should we now call her L’Oreley Taitz) infection. I do not think Nevedomskiy’s exploits contain code that infects HTML files this way, so we could be looking at key loggers or password stealers, but I leave that to the experts. Still, after scrubbing, remember to change your passwords. Perhaps we should all stop visiting birther and anti-birther sites as “administrators” and use a user account without rights to install programs or look at other users’ files. So now if you refuse to answer obvious questions designed to get information that is not permissible, you are in cahoots with Obama to hide information? I have written about Andy Williams’ latest outburst. Has anyone heard anything about Orly’s response to Judge Land’s proposed sanctions? If my arithmetic is correct, her response is due by tomorrow. Oct. 1: Barnett v. Obama surreply due. Oct. 2: Rhodes v. Obama response to OSC due. Oct. 5: Barnett v. Obama hearing. Oct. 6: Much rending of garments. …now would not be a good time to need some dental work in the OC…. Ha! Over on Facebook, Orly is recruiting people to attend the trial in January. I suggested that her fans should think twice before investing in non-refundable plane tickets. Misha, Andy Williams is a tool. He is a washed up has been. Like you said in your article, things that would have been vilified under Bush are now OK under Obama. For instance he is getting heat from the Right and the RNC’s head token Michael Steele that the President shouldn’t have gone to Denmark to push for Chicago to get the 2016 Olympics. Interesting. The President is pushing for an event that will drive the economy and infastructure and he is getting crap that he should be concentrating on the economy, healthcare, or the wars. However a year ago when Bush took off for a week to attend the games in China we did not hear one comment from anyone on the right. Amazing. You just have to laugh at the double standard by those on the right. I read Andy Williams article and I don’t care that he thinks Obama’s policies are Marxist. Really, most of the article was that he disagrees with Obama’s policies, and that is fine. Intelligent people can disagree about his policies. Where he loses me is when he said Obama wants America to fail. Really? What exactly would be anybody’s motivation to want “America to fail”? Like I have said before I disliked probably 75% of Bush Jr’s policies, but I don’t think he wanted America to fail. I even don’t think Cheny or Beck or Savage or Limbaugh want America to fail. No politician would want the political unit he is in charge of to fail. No glory in causing the failure of anything. Its really the whole fringe right(or left) wing politics of demonizing those you disagree with. Its just that Obama really, really brings them out of their closets and out of their hoods. Orly is still pushing the bogus argument about Obama’s Social Security Number, this time courtesy of a P.I. in Ohio. Susan is the Magnum PI of Cleveland. Without the ‘stache. I have a feeling that Orly’s dental employees and children know the feeling of working with very little direction. Or maybe a lot of confusing direction. Note that the investigator did not say how or where she “found” a Social Security number. Of course, Social Security numbers are confidential and would never be disclosed to a private investigator. Databases that are used by private investigators to locate SS numbers are compiled from a number of sources and are of dubious accuracy, as the sources an easily be corrupted. For example, if a person applies for credit using a fake name and social security number, it is possible that the name/number enter the credit-reporting system at that point. Names of celebrities are probably frequently abused, not only by would-be identity thieves, but by drunk people & kids playing pranks. As far as I know, there is no LEGAL way the investigator could directly access the information — for example, if you want to run a credit report on a person, you have to attest that you have a legitimate purpose. A PI might subscribe to a service that allows them to run credit reports and access other confidential information, but part of their subscriber agreement includes a promise that they will not run such checks unless authorized. So basically, this is an affidavit from a PI that either attests to the fact that she has broken the law by running unauthorized inquiries into confidential databases, or she is merely reporting information from an unnamed and unreliable source… or both. 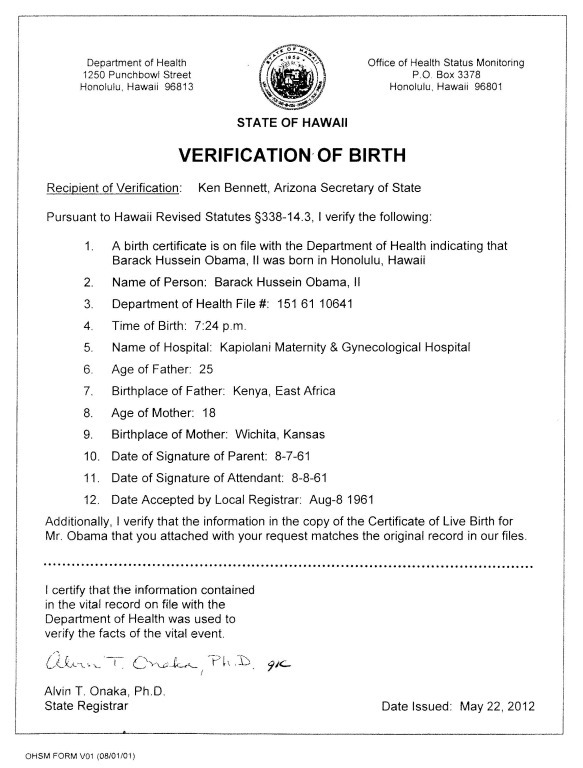 I’ll say Mahalo again to you Doc & to all the others who warn us about malware on Birther blogs. 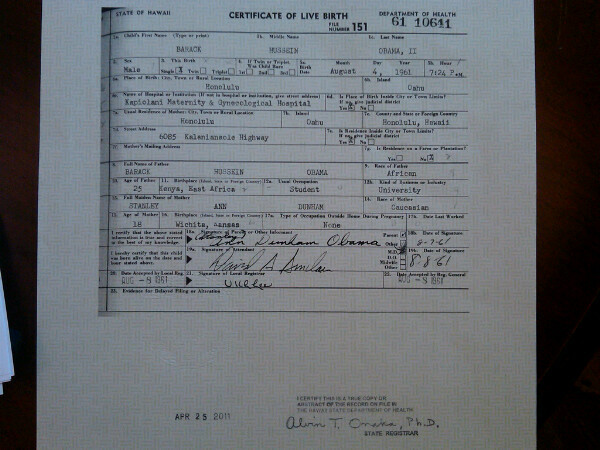 Thank heavens I can safely keep up with Birther insanity through your blog & others that are honest & reliable. You’re doing a great public service here & we sane Americans appreciate it. Mahalo to you too Paul! Barely computer literate folks like me are so thankful to read your warnings. Translation: I don’t work and play well with others. And, no one tells me what to do. Like, she lost her cash cow or what? How does a loner, senior citizen PI from Ohio get hooked up with Orly? A common goal: “get” Obama. I can see this lady deciding she’s going to be the one to get the goods on Obama. Just like the dozens of people who probably have taken it upon themselves to send clever letters to Hawaii saying they are related to the Dunhams and doing genealogical work so they need this and that about the Dunhams and Barack. 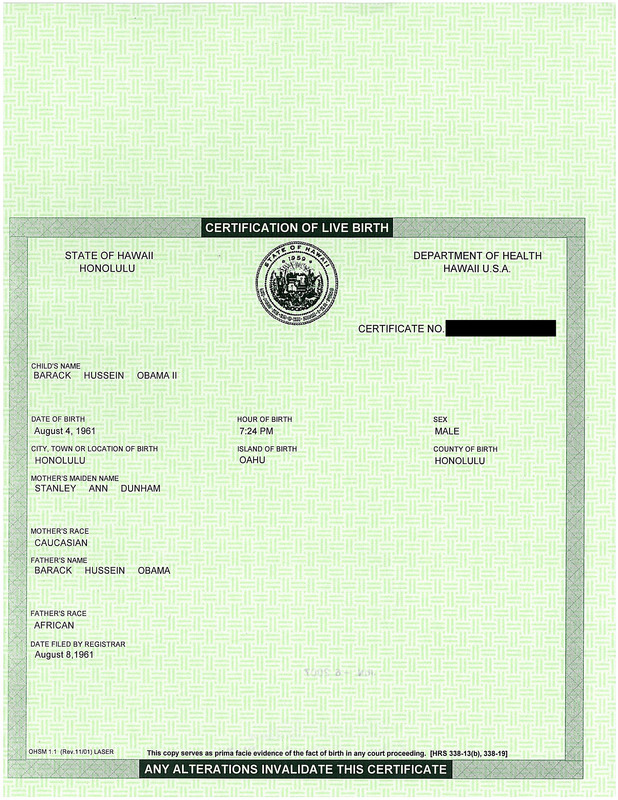 A common characteristic of birthers is they don’t seem to want to pool their ideas and work in a cooperative manner. They run around like they are the first person to think ” hey, let me run a credit check on Obama” or an intelius search, or letters to Hawaii. I bet most of them are/were a real pain the a$$ to manage at work. I am a PI myself, so I know all about the credit header databases and their permissible uses. They are valuable tools, but any PI worth his or her salt knows that they are just starting points and the information obtained has be correlated with other data for the reasons you mentioned. I looked over Orly’s list which was compiled by the California PI, Neil Sankey, and it is striking that almost all of the phony SSNs and addresses started to be reported shortly after Obama announced his candidacy for president. From an evidentiary standpoint, none of it is admissible because neither Sankey nor the Ohio investigator can attest to the sources of the information. 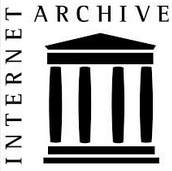 It is merely a compiliation of data from multiple sources. Many of the addresses listed are non-existent. Access to the information which Orly’s investigators obtained is governed by the Gramm-Leach-Bliley Act, and I would say that they are on shaky ground regarding the permissible uses. 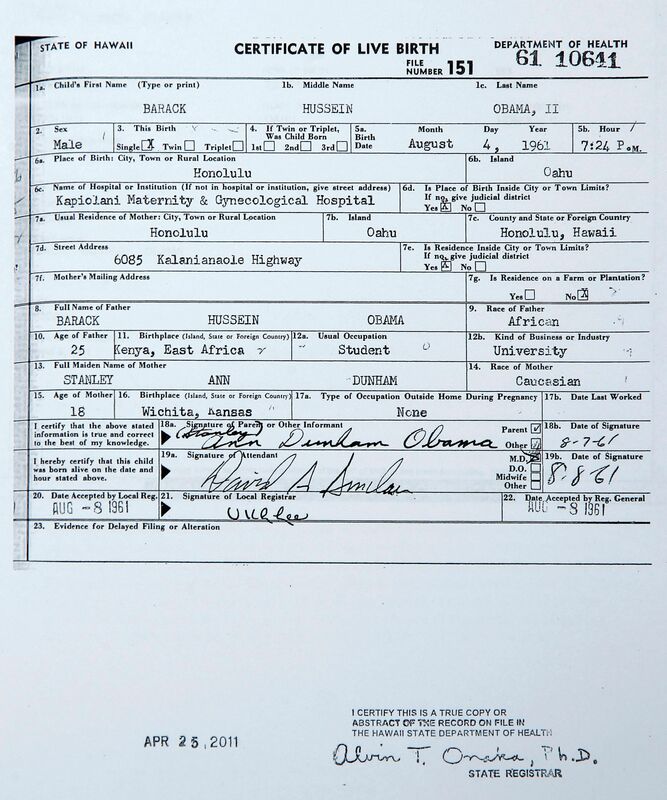 If they ordered a full credit report on Obama, they clearly broke the law as they did not have a permissible use or express permission from Obama. In addition, the Ohio investigator admitted that she researched the SSNs of other individuals, and she clearly had no authority to do that. Rickey: I would say that they are on shaky ground regarding the permissible uses. I’d say “no ground” — I certainly can’t think of any legitimate grounds. A PI can run an assets check without much reason — that is, a check to see what property is owned by a given individual — but I think the only time a full credit report would be appropriate would be if the PI was assisting in the enforcement of a money judgment against the target of the report. (The holder of the judgment would then be in the position of “creditor”). And even if a PI was running such a report appropriately, that still wouldn’t allow disclosure of a social security number. To me, if a PI looks at an SS and then reports something about that number to someone else, for any purpose that is not authorized — that is as much a violation of privacy as the obtaining of the number itself. 1) the execution of scripts must be prevented. That may be difficult to do when using Internet Explorer, so if you really want to see what L’Oreley is up to, use another browser with “Noscript”. Ask a techie to check your options and make sure script execution is excluded or at leads demands your express approval per page (and of course, remember to never say “yes” when visiting birther or even anti-birther sites and they want to execute scripts). And it does not really matter which site is redirected to vistaprint. If that happens, you should check your own computer for viruses and spyware and check your hosts file. After I had that re-direct I ran virus and spyware checks, nothing came back but tracking cookies, but after I cleared them and re-started no more re-direct. Thanks for the advice: clean, clean clean. I think I’ll just take all ya’ll’s word on what Orly is up to and stay away from her site from now on.